Venezuelans have a constitutional duty to rise up against Hugo Chavez because the South American president is becoming a tyrant, a leading political opponent said on a Washington visit this week. “It is constitutional to apply civil disobedience. A non-electoral solution is perfectly valid and perfectly constitutional,” said Alejandro Pena Esclusa, who ran against Mr. Chavez in 1998. “There is no electoral solution to the Venezuelan crisis,” Mr. Pena Esclusa told our correspondent Tom Carter. Mr. Pena Esclusa, who has been active in the political opposition to Mr. Chavez for 11 years, said Article 350 of the Venezuelan Constitution legalizes civil disobedience and directs the population to refuse to recognize tyrannical governments. Citing similar “non-electoral” civil disobedience in Ecuador, Peru and Bolivia, in which the people went to the streets and paralyzed the government until the leadership was changed, Mr. Pena Esclusa said it is the patriotic duty of Venezuelans to oust Mr. Chavez. Since Mr. Chavez was re-elected to another six-year term with 63 percent of the vote on Dec. 3, he has become even more radical in moving Venezuela to the left. He is nationalizing the oil industry, which supplied the United States with $30 billion in oil last year. In an assault on free speech, he is shutting down opposition newspapers and television stations. And he is establishing economic ties and giving aid to leftist governments in Nicaragua, Ecuador and Bolivia, while pledging solidarity with Cuban President Fidel Castro and Iranian President Mahmoud Ahmadinejad. 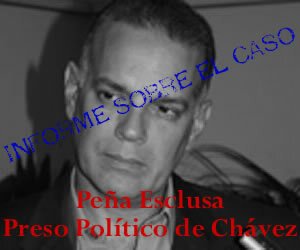 Mr. Pena Esclusa urged those interested in the situation in Venezuela to visit www.fuerzasolidaria.org, the Web site of his organization Solidarity Force..